Rational optimization of peptide anchor residues in mouse Tyrp1 enhances MHC class I binding. Tyrp1-optimized peptides (white bars) and their wild-type counterparts (black bars) were assessed for MHC class I stabilization in assays using RMA-S cells. 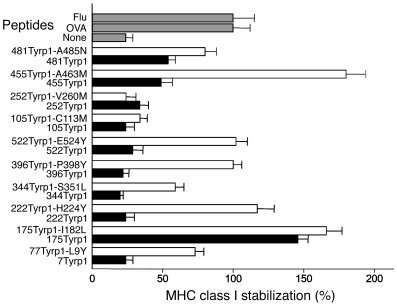 Results are expressed as percentage of MHC class I stabilization relative to OVA and influenza (Flu) peptides. Experiments were performed twice in triplicate with identical results; error bars represent standard deviation of the mean.